Ah, that dreaded day is upon us again. If you’re not one of those shelling out thousands of pesos for that one date on that most holy day for dates (roll eyes), why not shell out money for a cause? 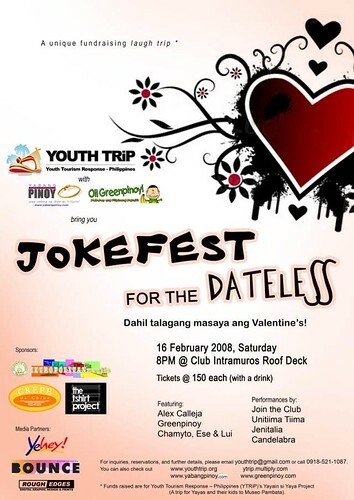 The Youth Tourism Response Philippines (YouthTRiP) brings you Jokefest for the Dateless, a fund raising event for their upcoming Yayain si Yaya project. A project that will take Yayas and their kids and wards to Museo Pambata for an afternoon of history, storytelling, and Pinoy games. It is a tribute to our second mothers and quasi-big sisters. This laughfest is happening on the 16th of February at the Club Intramuros in… Intramuros, Manila. Doors open at 8pm. Entrance fee is Php150, which includes one drink and a night of fun and laughter. For any questions, comments and violent reactions, contact YouthTRiP at 0918-5211087 or e-mail them at youthtrip@gmail.com. If celebrating your singledom is not your thing, how about dropping by at the Dolls for a Cause at the Podium? We invite you to be a part of Manikako, Future Ko! A Fund-Raising Doll Fair at The Podium Activity Center along 18 ADB Avenue, Ortigas Center, Mandaluyong City., February 16 to 23, 2008. The proceeds of the event will fund free doll-making workshops for underprivileged kids conducted by the House of Comfort Art Network (ARTHOC). The week-long fair will open with a “loud auction” conducted by artist/critic Cid Reyes on February 16, 6pm with TV personality Tintin Bersola Babao as program host. Doll-making workshops will be held daily at the fair, led by a wide variety of groups such as : ManikaManila, avid collectors of ball-jointed dolls; Mistula, concept doll band; Pilipinas Street talented grafitti artists; Sewing Circle, needlepoint craft enthusiasts; Creatives from Y & R Philippines; Superficial Girls; and, INK or Illustrador ng Kabataan whose works breathe life into Filipino children’s literature. (Do it yourself) doll manikako kits and other manikako products will be available for sale during the event. Capping the week is Salamat sa’yo, Manikako!, a thanksgiving celebration featuring musicians like Moonstar88, Joey Ayala, Susan Fernandez Magno, Ciudad and the multiawarded performance poet, Vim Nadera, among others. Know more about Manikako, their projects and their cause over at Manikako.com. If you *do* celebrate Valentine’s day, how about taking in a movie? True to form to their themes of love and its different vagaries, filmmakers Paolo Villaluna and Ellen Ramos follow up their highly-acclaimed debut film ILUSYON (Rated A 2005, Cinemanila IFF 2006, Pusan IFF 2006) with the tragic tale of 3 characters in Selda. The film stars Sid Lucero, Emilio Garcia and Ara Mina. Also starring are Michael de Mesa, Allan Paule, Soliman Cruz and Ping Medina. It may not the be your typical date movie, but at least it’s something different, eh? ooh, mukhang interesting ang doll fair! papayag silang magpaphotograph ang mga manika?!? Hi Nina! Happy hearts’ day! hi nina! ang ganda pala ng site mo… dito pala kita pwede “makita”… until then. Dyanie: Happy erm, Friday to you! Owen: Haha, yep, I can be usually found lurking around these parts Looking forward to seeing you next Saturday!